WMAP Seven-year Paper Figures, N.Jarosik, et al. 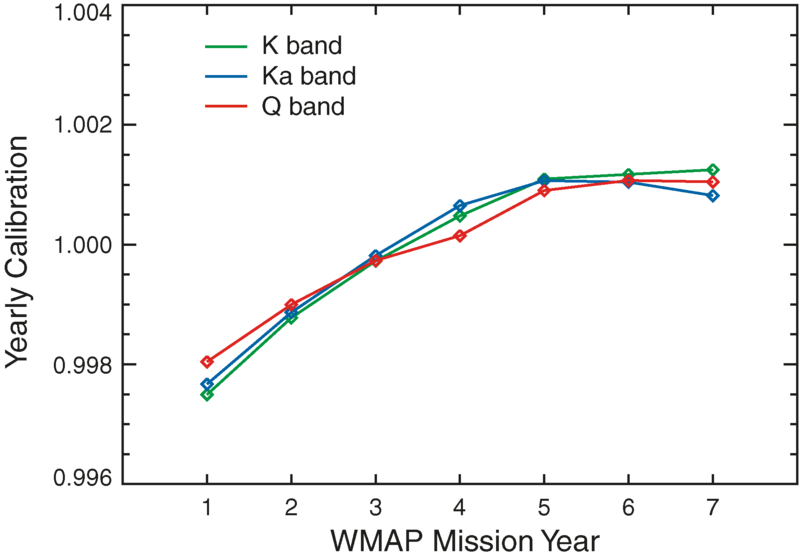 Measurements of the year-to-year calibration variation for K, Ka and Q bands obtained by correlating the Galactic plane signal in the seven-year map to the signal in single year sky maps. Note that the measured variations are consistent with the estimated absolute calibration uncertainty of 0.2%. No significant variation is seen for the V and W band maps. Physical optics beam models for the W1 DA on the A side (left) and B side (right) of the WMAP instrument. The ordinate is scaled by a sinh-1 function that provides a smooth transition between linear and logarithmic regimes. Blue: five-year models; red: seven-year models. 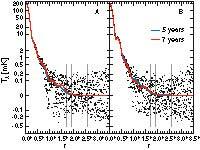 Points: seven-year Jupiter beam data averaged in radial bins of Δr = 0.'5. Dashed lines: Radii at which hybrid beam profiles consist of 90%, 50%, and 10% Jupiter data, respectively, from smaller to larger radii. Model differences inside r ~ 1°.7 are mostly suppressed in the hybrid beam profiles, whereas model differences outside r ~ 2°.6 are mostly retained. W1 hybrid beam profiles from five-year (blue) and seven-year (red) analysis, combined for the A and B sides. The ordinate is scaled by a sinh-1 function that provides a smooth transition between linear and logarithmic regimes. Dashed lines: Radii at which hybrid beam profiles consist of 90%, 50%, and 10% Jupiter data, respectively, from smaller to larger radii. The noise shows that use of Jupiter data extends effectively to larger radii in the seven-year analysis. Comparison of beam transfer functions and uncertainties between five-year and seven-year analyses. 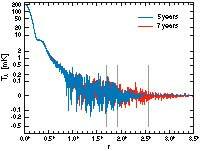 Black: Relative change in beam transfer functions from five to seven years in the sense (7 yr - 5 yr)/(5 yr). Green: five-year 1σ error envelope. Red: seven-year 1σ error envelope. 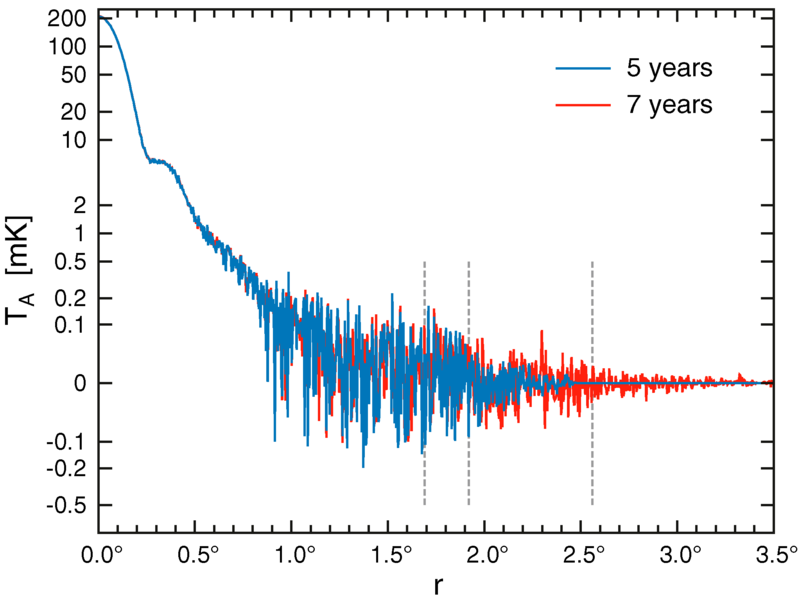 The seven-year bl are largely within 1σ of the five-year bl, while the change in the error envelope itself is small. In W band, modeling differences between the A and B sides introduce an increase in the uncertainty plateau for multipoles l ≤ 1000, whereas the small angle (high l) uncertainty is decreased for all bands. Plots of the Stokes I maps in Galactic coordinates. 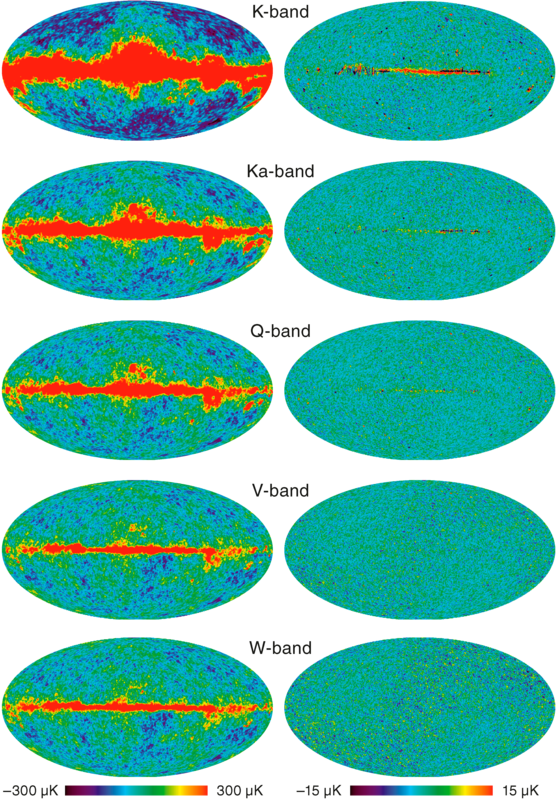 The left column displays the seven-year average maps, all of which have a common dipole signal removed. The right column displays the difference between the seven-year average maps and the previously published five-year average maps, adjusted to take into account the slightly different dipoles subtracted in the seven-year and five-year analyses and the slightly differing calibrations. All maps have been smoothed with a 1° FWHM Gaussian kernel. 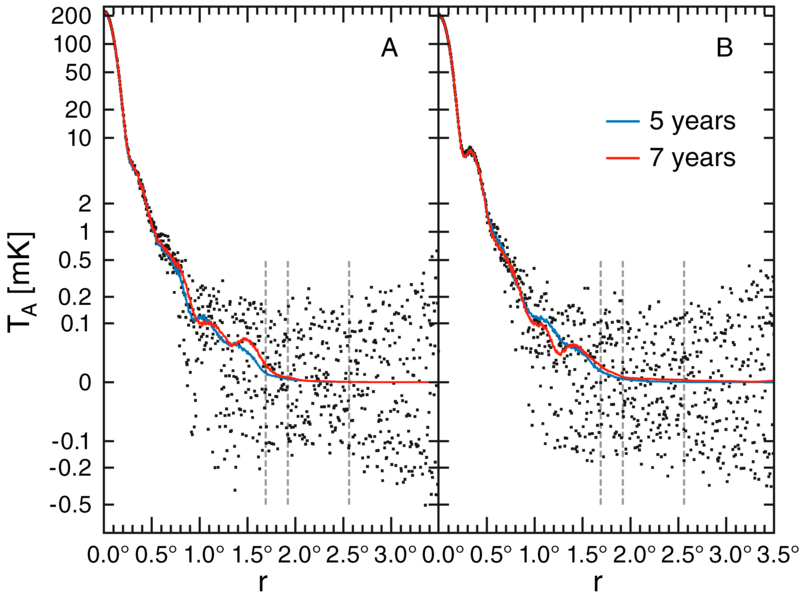 The small Galactic plane signal in the difference maps arises from the difference in calibration (0.1%) and beam symmetrization between the five-year and seven-year processing. Note that the temperature scale has been expanded by a factor of 20 for the difference maps. 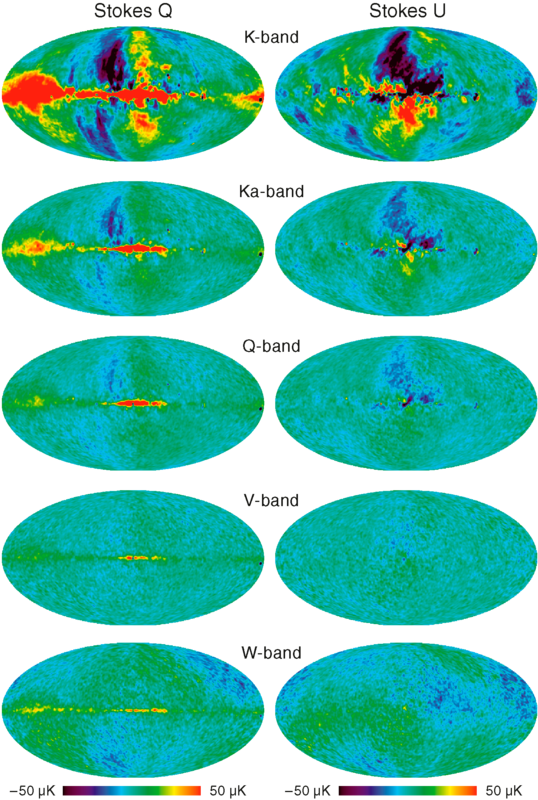 Plots of the seven-year average Stokes Q and U maps in Galactic coordinates. All maps have been smoothed with a 2° FWHM Gaussian kernel. 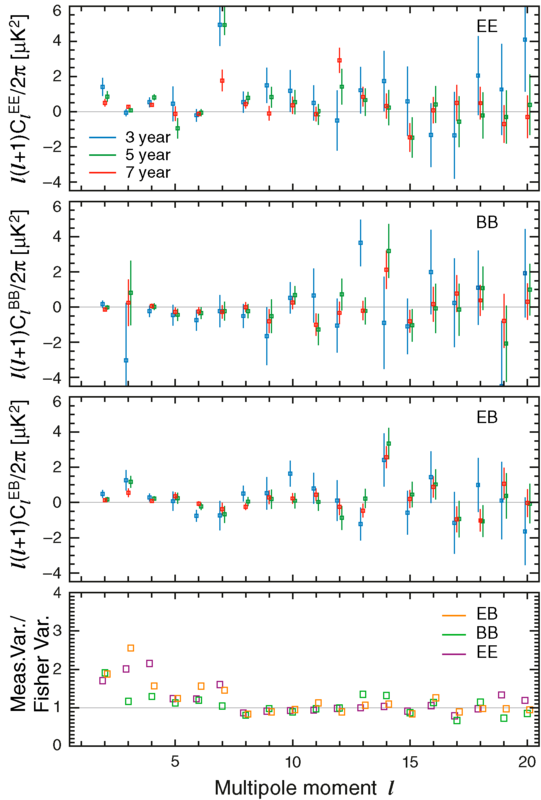 Low l Master polarization cross power spectra from the first three, five, and seven years of data from the W1, W2 and W3 foregrounds reduced polarization sky maps (Gold et al. 2010) for the first three, five and seven years of observations. These three time ranges contain 36, 105 and 210 individual cross spectra respectively. The l values for the different time ranges have been offset for clarity. 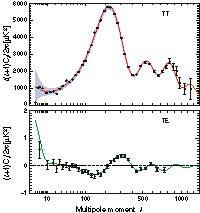 The top three panels contain the Master power spectra and error bars based on a Fisher matrix analysis. The bottom panel is the ratio of the measured variance between the individual power spectra estimates ( DA year × DA year ) and the variance predicted by the Fisher matrix calculation using the full Σ-1 inverse noise covariance matrix. Note the good agreement for l ≥ 8. 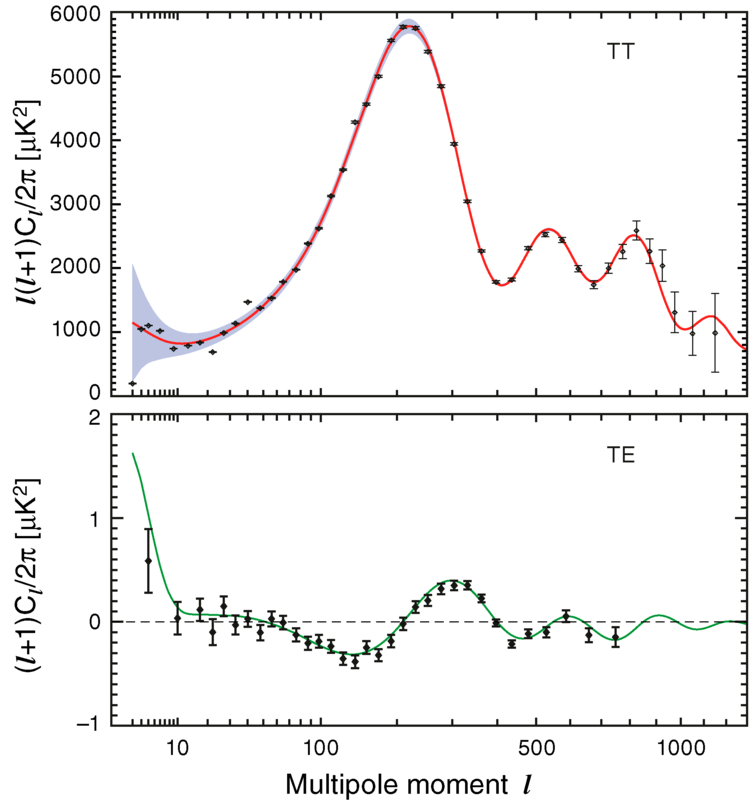 Low l Master polarization cross power spectra from the first three, five, and seven years of data from the W1, W2 and W3 uncleaned sky maps. The l values have been offset slightly for the different time ranges for clarity. 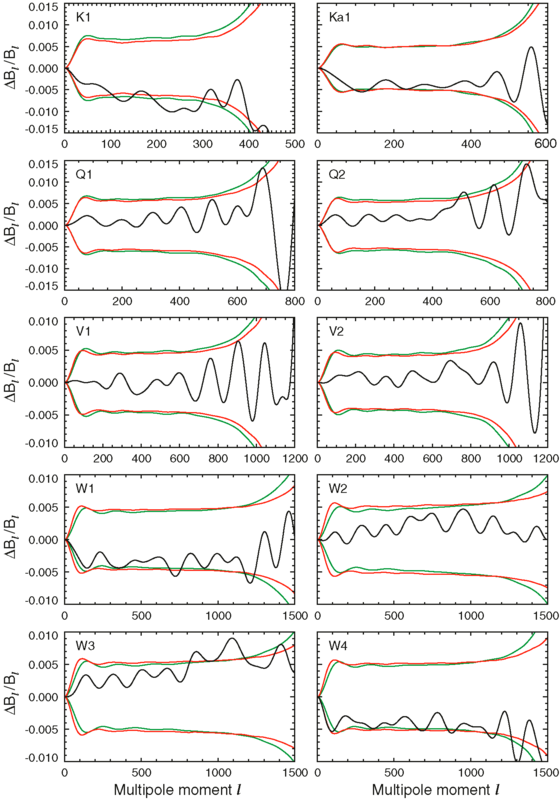 The bottom panel is the ratio of the measured variance between the individual power spectra estimates ( DA year × DA year ) and the variance predicted from a Fisher matrix calculation using the full Σ-1 inverse noise covariance matrix. Note the good agreement for l ≥ 8. The temperature (TT) and temperature-polarization(TE) power spectra for the seven-year WMAP data set. The solid lines show the predicted spectrum for the best-fit flat ΛCDM model. 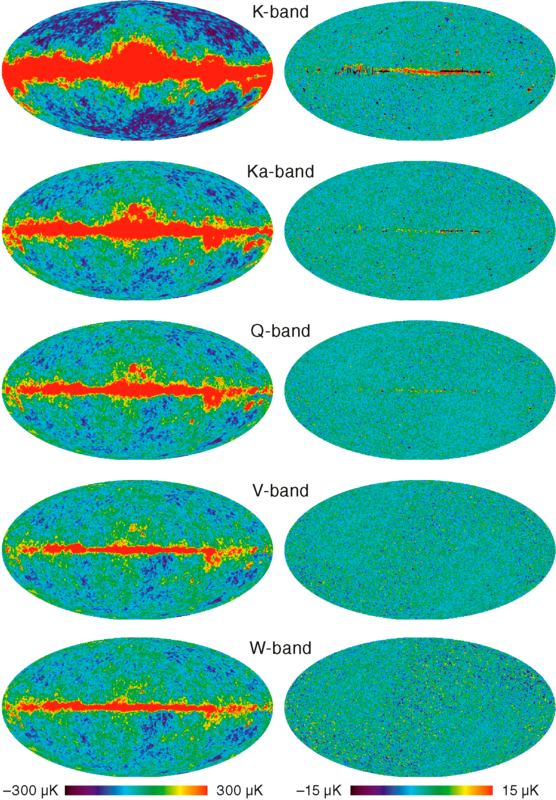 The error bars on the data points represent measurement errors while the shaded region indicates the uncertainty in the model spectrum arising from cosmic variance. The model parameters are: Ωbh2 = 0.02260 ± 0.00053, Ωch2 = 0.1123 ± 0.0035, ΩΛ = 0.728+0.015 -0.016, ns = 0.963 ± 0.012, τ = 0.087 ± 0.014 and σ8 = 0.809 ± 0.024.